The England seamer tore through the hosts' top order, dismissing John Campbell, Kraigg Brathwaite and Darren Bravo in quick succession after Joe Root's declaration had set them an unlikely target of 485. England already held a healthy advantage of 448 overnight and they increased that by a further 36 in the first 5.2 overs, with Ben Stokes thrashing a string of boundaries to reach 48 not out. Captain Joe Root (122) declared immediately after he miscued a full toss from Shannon Gabriel to mid-wicket, leaving Windies to either score 485 or survive more than five and a half sessions for a draw. The home side's prospects took an immediate knock when Campbell departed for a golden duck in Anderson's first over, superbly caught by the diving Moeen Ali at gully. Brathwaite (8) was Anderson's next victim, prodding forward and edging to second slip and, when Bravo (0) played a loose drive that flew into the hands of Root, Windies were reeling at 10-3. Shai Hope (14) seemed to have steadied the ship, but Mark Wood induced a leading edge that flew to the back-pedalling Stuart Broad at point to leave Windies 35-4 at lunch. 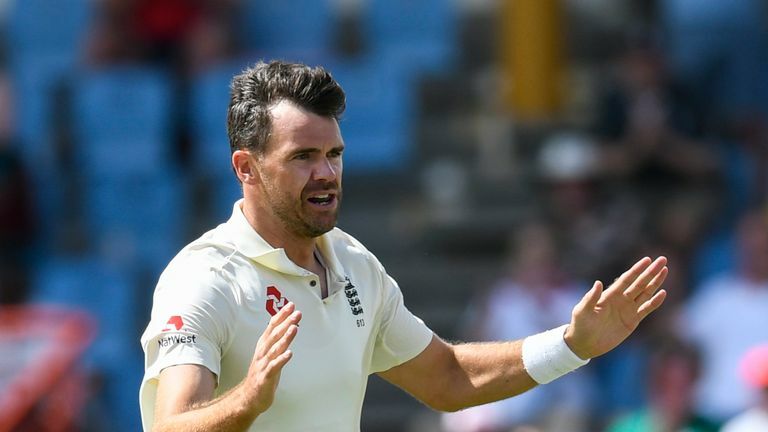 Watch day four of the third Test between Windies and England, in St Lucia, live on Sky Sports Cricket. You can also follow over-by-over commentary and in-play clips on our rolling blog on skysports.com and the Sky Sports app.